We are looking to traveling on a long haul flight this winter. When I mean long haul I mean a 14 hour non-stop flight. Obviously, we are not rich enough to buy Business Class so we wanted to find some good seats for our travel. You don’t have to be a frequent flyer to know that there are vast difference between airline seats. What started as a frequent flyer Mathew Daimler’s interest in finding the best seats on different airlines and share it with his fellow travelers exploded into a very successful site. In fact, Trip Advisor saw it fit to purchase the site in 2007 and has helped in its growth to becoming a trusted source. SeatGuru.com now covers 700 airplane seatmaps from nearly 100 different airlines. 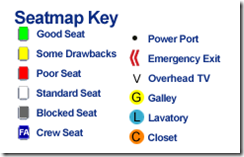 One of the important things you want to look for in a SeatGuru seatmap is the ‘Seat Pitch’. 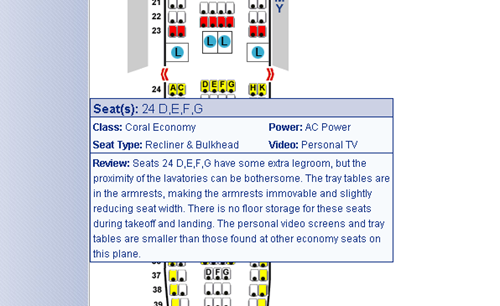 If you can’t find this information on SeatGuru, you can also call your airline to find this information. This could make a huge difference while flying. When you view a seatmap for an airline the seats are color coded. You can search your flight with just the airline name and the flight number. The airlines are listed by alphabetical order for easy lookup. You can also find information about if you have access to a Power port, personal TV, Wi-Fi for your flight. A little research on SeatGuru could help you avoid bad seats on a flight and ensure you get the best seats possible for your money. I can’t believe I never knew about this site when I took my previous long haul flights but I am glad I did now.